He was lovely, he was great fun… he was called Soupy because he was always first in the chow line. He was such a lovely person to be with. We just hit it off so completely. While the 8th USAAF were based in Britain during the Second World War, strong relationships were forged between the Americans and their hosts. A testament to this can be found in the stories of the GI Brides. Around 70,000 women left Britain between 1945 and 1946 to begin a new life in America with the US servicemen they had met during the war. After the war ended The War Brides Act allowed spouses and children of US servicemen to enter the United States as non-quota immigrants. 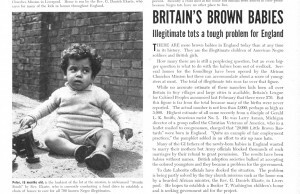 Many left Britain to embark on a new life. This often meant leaving families behind. 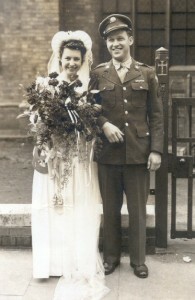 As a young boy living with his family in Norwich during the war, Brian Staff’s two sisters married US servicemen. He tells of visiting one years later: “I got in touch with my sister and she travelled about 80 to 100 miles away to meet us in Florida and that’s about the last time I ever seen my sister”. His story is a common one – highlighting the reality that when these young women left to begin a new life, often they did not return or see family members again. 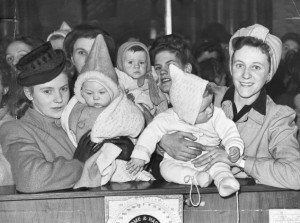 GI brides and their babies get ready to fly to America for Christmas 1946. Unfortunately, their flight was turned back because of bad weather. These women and their children had to wait for another opportunity to reach their new home. Many marriages survived, however some women found that once settled in their new surroundings, they were faced with men they hardly knew. It was often the case that women, having moved to America, would find themselves incredibly isolated. Some even made the journey back across the Atlantic after their marriages failed.